This open-face smoked salmon and cream cheese bagel is a great breakfast or brunch offering. Most grocery stores sell pre-sliced smoked salmon and cream cheese, which makes this recipe a snap. Smoked salmon is a preparation of salmon that has been cured and hot or cold smoked. Due to its moderately high price, smoked salmon is considered a delicacy. Although the term lox is sometimes applied to smoked salmon, they are different products. Lox is brined salmon. Lox can be used in place of smoked salmon in most recipes including this one. The smoking process is used to preserve salmon against microorganism spoilage. During the process, the fish is salt cured and partially dehydrated, which impedes the activity of bacteria. Bacteria like Clostridium botulinum, which can sometimes be present in seafood, is killed by the high heat treatment that occurs during the hot smoking process. The high salt content prevents the growth of microorganisms. Salmon is a fish with high-fat content and smoked salmon is a good source of omega-3 fatty acids. Three ounces of smoked salmon contains approximately 660 mg of sodium, while an equivalent portion of fresh cooked salmon contains about 50 mg. Other byproducts of the smoking process are nitrates and nitrites, or nitrosamines, which may be cancer-causing. Although, smoked salmon is not a major source of nitrosamines. Spread the toasted bagel bottom halves with cream cheese. Sprinkle half the capers over the cream cheese, if desired. Top with sliced smoked salmon. Garnish the bagel tops with the rest of the capers, onion, and black pepper. Serve right away with lemon wedges. 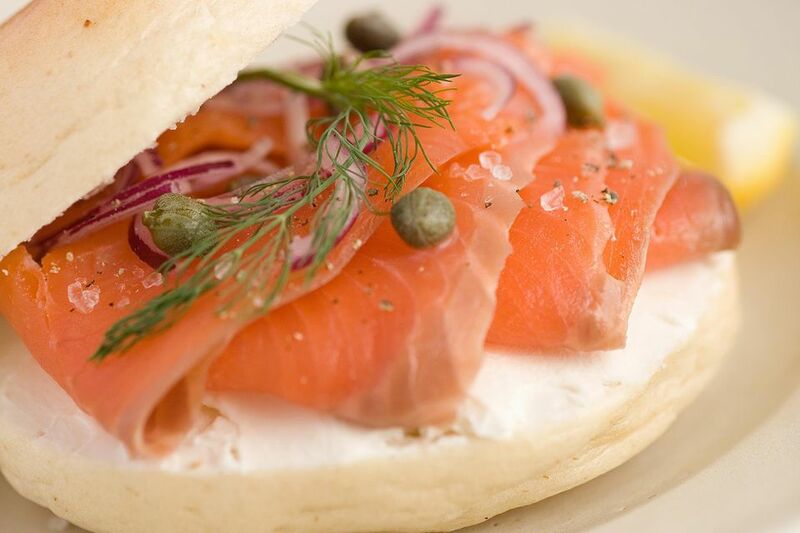 Other ingredients that go well with the smoked salmon bagel are fresh herbs like dill or chives. You can add a few thin slices of tomatoes or cucumbers. Another variation on this popular bagel combination includes avocados. Most everyone loves bagels. But, everyone might not love smoked salmon or lox. You can host a brunch party, bridal shower, or baby shower and offer a bagel bar that allows your guests to build their own bagels. A few big pluses about a bagel bar is that it is relatively easy to set up if you can get access to fresh bagels the morning of the party. A bagel bar requires zero cooking time. And, a bagel bar is not season-dependent, it can work all year-round. If you think you might have gluten-free, dairy-free or vegan guests, the answer is simple: buy a few gluten-free bagels and get toppings that are dairy-free, like tofu-based spreads.